It takes a few months of unfavourable weather to really appreciate the fantastic weather we are now enjoying. Club activities are being well attended with visiting clubs and holidaying golfers also enjoying our course. Gympie Vets sent a large contingent of over 40 players to compete in April and Tin Can Bay Vets will reciprocate in June. Club Championships are just around the corner and players are endeavouring to hone their skills to be at the top of their game. 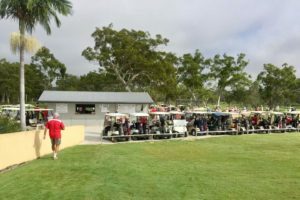 The men’s Pennant team are getting plenty of practice competing for their club against Noosa Springs, Maroochy River and Peregian Clubs and the ladies’ team is continuing last year’s good form against southern clubs. We welcome new and social golfers to our club. Just check in at the Starter’s Box any day from 7 am to organise a game or phone 0484 0055266.